I purchased a home in Colorado and inherited a solar electricity system that I think is not working as expected. As a point of reference, I do have an Outback grid-tied system back home in Maryland that has been functioning since around 2008. The Colorado system is a Xantrex XW6048 single inverter with about 4kW of PV in two strings going to 2 MPPT60-150 charge controllers and a 48V 415AH battery bank. As mentioned the system is grid tied and the odd behavior is that when the grid is active (AC1 input), the system never inverts available DC power from PV. It always stays in AC Passthrough mode. 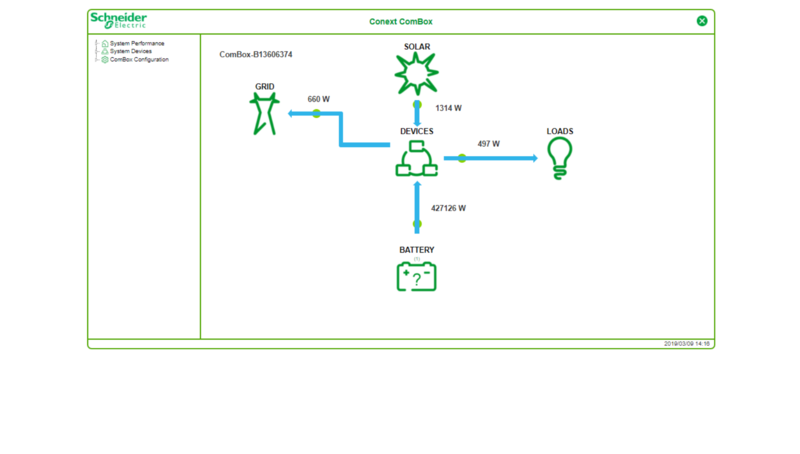 I know there is PV available because when I shut off the AC1 input breaker (disconnecting from grid), the system immediately goes to inverting PV and battery power to supply the loads (have been running in the 400-800W range this morning). The system is generally with the default settings as I did a system reset to factory defaults earlier. I would think that out of the box, the system would take any available PV power and power loads up to its max collection capacity and then supply the rest with the grid like my Outback system does in Maryland. And since I never noticed this in Maryland since my system is also designed to sell-back excess PV to the grid, the Colorado system seems to throttle itself down to the current load. i.e. if my loads are 350W, it will supply that amount of power. If I turn on more stuff and bring the load up to 750W, it will power up to supply that load. 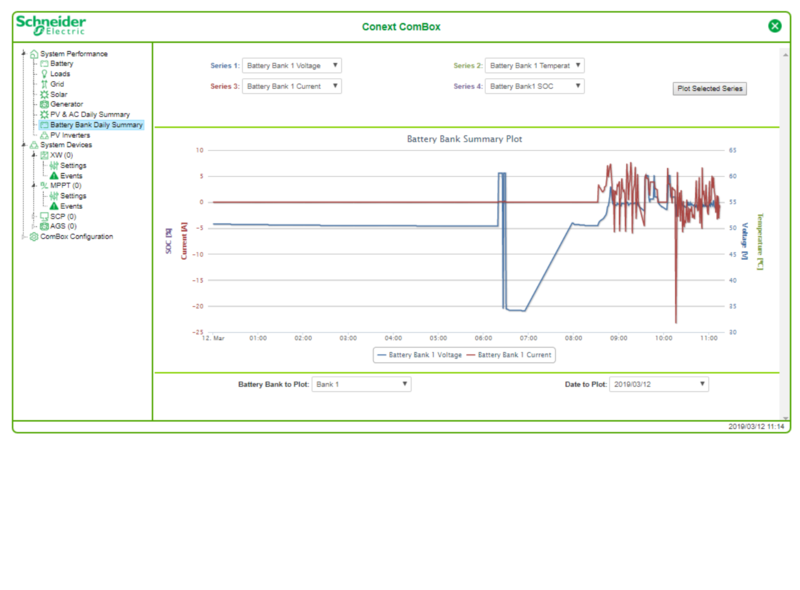 And when I then turn off these additional loads, the supplied PV power goes back down the supply only the lower load. 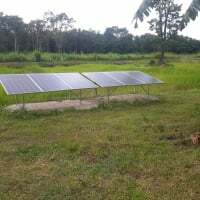 The behavior that I would expect is that when there is PV power available, it would a) charge up the batteries and b) power the loads up to its supply potential. It would then use the grid to supplement either a) or b) if the loads are greater than the available PV. If the available PV is greater than a) + b), then it should sell that power back to the grid. Ideally, my system would maintain the batteries at full continually and float it indefinitely until there was a power outage. Assuming the batteries were kept fully charged, any PV power above and beyond my loads plus whatever is needed to float the battery bank should be sold. As it's a vacation house and the loads are nominal 85% of the year, I would expect that there would be an excess of PV generated compared to total loads over the course of a year, but that has not been the case. I did hook up a ComBox while here at the house this week and can see this behavior clearly. Any suggestions on what to look for in the configuration? I am assuming a) the system is wired correctly (there was a business card of a solar company inside the inverter when I opened it up, but a phone call to the number on the card yielded a disconnected message) and b) that it was functioning fine at some point in time before I purchased the house. I'm assuming the solar has been with the house since it was built in 2008. Thanks for your thoughts. According to a manual I found online, it looks to me like grid support is disabled by default. There are also settings for battery voltage etc which may need changing from defaults. Grid support is enabled. And I think I found the problem. I had set Grid Support Voltage too high at 56V. I guess resting battery voltage was lower than that so it wasn't "supporting". I set the Grid Support Voltage to 54.6V (what Fullriver publishes as its recommended float voltage) and it appears to be functioning as expected now. I will continue to observe and see what happens. But a smile is on my face now! I also updated the firmware of the two MPPT60's as well. I wouldn't have expected that to be necessary to get this basic functionality, but you never know, because I think I've tried this combination of configuration voltages before and it didn't result in the expected behavior! Now I just have to contact Schneider and inform them that their wattage calculation for battery output is way off. I *wish* I were drawing 427,000 W from the batteries, but it's really usually just a couple of hundred watts going back and forth. My new problem I discovered overnight. Despite the system being in AC-Passthrough mode overnight (no PV input), the battery appears to be self draining until it hits my "recharge voltage" of 51V. The inverter then goes through a charge cycle and seems to leave the battery bank at about 54V. But then there is a continuous drift down of the voltage down to "recharge" and cycle starts again. My understanding in AC-passthrough mode, all the loads are supplied by the grid as I desire. I want my batteries essentially to always have a full charge and not cycle. The previous night (before I got things working for accepting PV during the day as a result, I think, of a firmware upgrade) the battery bank seemed to sit happily at 55 volts, also in AC-passthrough mode. When I went to check the charge controllers last night (about 11:30PM), they were reading Absorb mode and "Low Light". This to me, sounds fishy. I would think they should be in standby of some sort. I read somewhere something about a phenomenon where the batteries would drain back to the panels if their Voltage is lower than Battery Voltage. Aren't there diodes of some sort that prevent that? 51v is just about the resting voltage (no loads or charge source) of a fully charged bank. 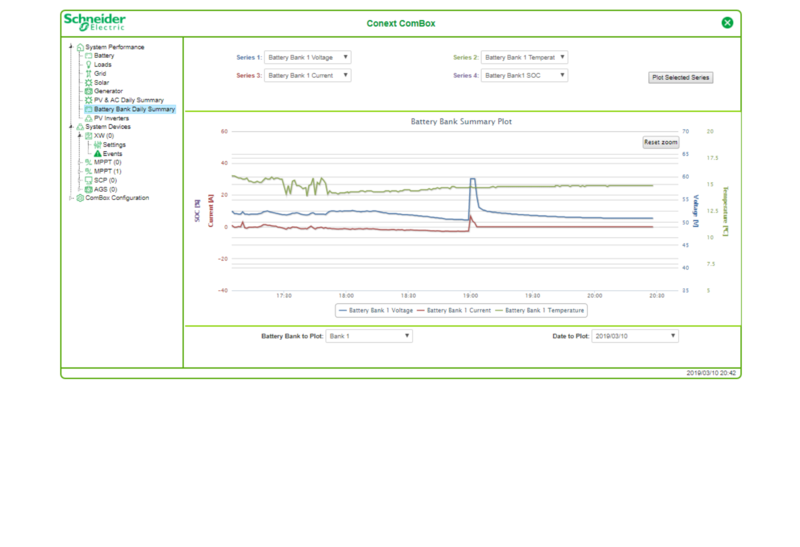 With a bit of wire loss and/or measurement error, you appear to be running absorb cycles on a fully charged bank. Voltage hits Vabs almost immediately, which confirms a full bank. I'd set the recharge voltage a bit lower to prevent this. I set the recharge voltage down to 50V and it seems to have calmed it down. In trying to isolate where the fault was I had shut off the inverter function and shut off the battery and PV breakers. So the only thing connected to the DC side was the XW6048 charger. In wanting to harvest some solar this bright, sunny Colorado day, I turned the chargers back on and turned on the inverter in the XW6048. As before, it harvested some solar but now the system is back in AC passthrough mode. I'm beginning to question the charge controller(s) at this point. But will fiddle with the grid support parameters for a little bit. Without the diode (or at least a functioning diode), would the loss go up at night when presumably the voltage (and amperage) of the panels should go to zero? Did you close the battery breaker first and let the controllers boot fully before closing th pv breakers? 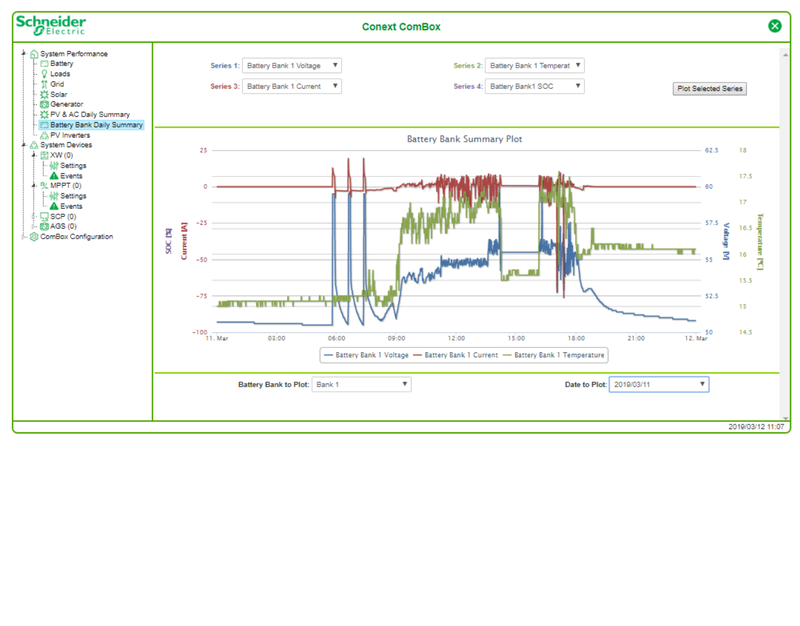 Odd things can happen if CCs see pv before bank voltage. Is battery voltage over grid support voltage? Don't recall the order I flipped the switches. Didn't consider the fact that it might make a difference. I will certainly use the correct order going forward. I would like selling to occur only when the battery bank is full and there is excess PV on top of any charging needs. So I purposely set the grid support voltage high. I started with 53V. But the system was doing this odd flip back and forth thing between PV charging and supply loads and PV just charging and inverter supplying loads from grid. This was with about 600-700W reported PV coming in. I lowered the grid support voltage to 52.4V and that seemed to have cured the flip-flop thing. But I want to be sure that when the sun is down that the system has a fully charged battery bank. I'm a little perplexed at why the system was pulling in 1300W yesterday and only mid 600W today. Seemed to be about as sunny. We'll see what happens tomorrow. I'll recycle the charge controllers and boot them up in the proper order tonight. Maybe that was it. The 60-150 controller has a relay disconnect in low light conditions, the controller status is what the controller was doing prior to disconnect, example, this morning before sunrise mine said low light, scrolling down it displays float, which is what the last state the system was at yesterday. When the firmware was updated were all the settings checked to verify they were at the same values prior to the update? Yes, I've double and tripled checked the settings. That being said, I'm still fiddling with them to try to get the system to behave as I expect. The issue I'm scratching my head about now is how much internal discharge a battery bank like this is expected to have? These are brand new AGM batteries. This is a snapshot of the last couple of hours -- since sunset. One can see in the blue line that the battery voltage slowly drifts down and then the inverter charges it for a few minutes. Then the voltage slowly drifts down again. I'm going to see how many times it hits the 50V recharge threshold overnight. This is with no loads. The inverter is in AC-passthrough mode. Looking at the above graphic, the battery voltage drops to just above 50V, it is normal for the voltage to drop to a stable value. The recharge setpoint prompts a charge which lasts a few minutes pushing the voltage up to 60V, this process will repeat itself. 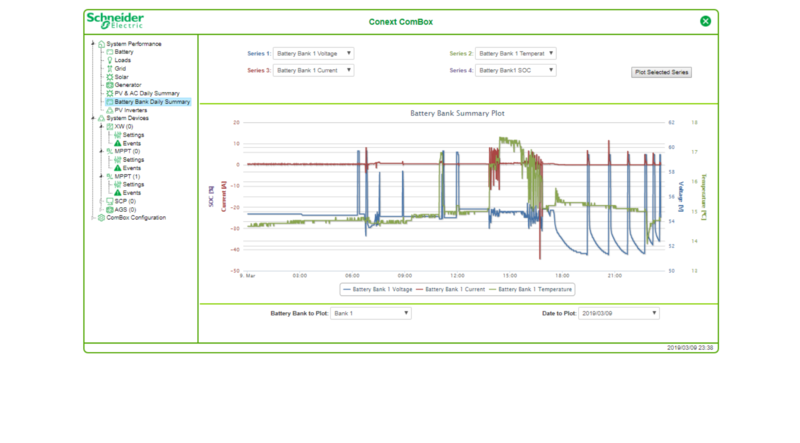 There appears to be a minor draw on the battery judging from the current, which increases as the voltage drops, which is normal , probably the devices self consumption. This appears to be a normal standby charging profile, keeping the batteries in a float condition, the float voltage would be dependent on the battery manufacturers specifications. Actual voltage may vary due to temperature compensation, but the battery will never hold 60V, even if physically disconnected it will settle to a value in the 50-51V range. The battery manufacturer publishes a recommended float charge voltage of 54.6V. So that's what I have my inverter and charge controllers set to. What you're saying is that the actual float voltage of the resting battery bank should be in the 50-51V range? Is my recharge voltage of 50V reasonable considering I want the batteries always fully charged? Can I expect that the change over time as the batteries age? They are brand new right now. And am I correct in understanding that this overnight behavior of these "mini charges" would not be considered any sort of "cycling" of the batteries and shortening their lifespan? Ideally, these batteries are kept at float continuously unless there is an outage. At which time I've programmed the low battery cutout to be at 48V. Probably conservative considering the number/length of outages I expect around here. I think the factory default was 44V? It looks like the "mini charge" from last night held until about 6AM at which time another "mini charge" occurred. Interestingly, there had to be two more in a short time period. This bolsters your theory that it may have something to do with system drainage? Perhaps the charge controllers were waking up and draining power? Is there any way to have all the system components draw power from the grid instead of the battery to prevent this phenomenon? The system currently looks like it is trying to hit bulk voltage of 58.8V. I will find out today if the system is smart enough to get to bulk/absorb before selling. To clarify, resting voltage is what the fully charged bank will settle at if disconnected, roughly 51v. Over time (weeks-months) this resting voltage will drop as self-discharge reduces the state of charge. The rate of self-discharge varies with battery construction, chemistry, and temperature. To offset this self-discharge, the bank can be charged with a full bulk/absorb cycle periodically, or held at float voltage (~54v) more or less continually. If the batteries are flooded, they should be bulk/absorb cycled every couple of weeks to avoid stratification. At 48v, the bank is ~50% SOC, which is about as low as you want it to go. Unless you have large, shortish loads (eg pumps) which will sag voltage causing false LBCO hits, this is probably a good value. With no light, the CC should sleep, using maybe a few watts. With enough light for voltage, it should wake up and use more. Things seem to be working as expected after a period of parameter tweaking and firmware updating. Thanks for all of the guidance and suggestions. Observation - It seems that at the end of the day, the inverter doesn't respect the Grid Support Voltage. This is yesterday. One can see at the end of the day, around 18:00, the voltage of the battery going down as the amount of PV available is also going down. My Grid Support Voltage with selling enabled is set to 54.6V (which is the float voltage recommended by the battery manufacturer). One observes that early in the day the inverter is trying to maintain about 54.6V pretty successfully and in the process is powering all my loads and selling to the grid. Why there is so much back and forth of flow (evidenced by the wild undulations of the amperage readings) is still a mystery to me. I don't recall my Outback system at home doing this. I payed with the Grid Support Voltage later in the day and did some more troubleshooting/tweaking. But at the end of the day, the system was continuing to sell to the grid from the battery until the voltage was about 52.7V at which point I shut off the selling/grid support functions and let the system settle into a resting mode. As expected the voltage drifted downwards slowly over night ending up around 50.5V this morning when I did more fiddling with the system. This is today so far and I'm please that there are now no more "mini-charges" happening overnight. The "down" period was me shutting off the system to swap my charge controllers as part of my diagnostic process of figuring out why I'm only getting half-power from my system (bad charge controller). And then the other down period about 09:30 is me updating the firmware of the inverter. Since then the system is keeping around 54.6V nominal while supplying all the loads and selling to the grid. Still perplexed at the frequent shifting of positive and negative flows to/from the battery evidenced by the amperage readings, but perhaps that is just the nature of the selling feature? I'll be interested to see if the firmware update improves the end-of-day functioning of the transition from Selling to AC-Passthrough as the sun goes down. I don't want to sell down into battery capacity. In a nutshell, my question is what does the Maximum Charge Rate (%) set/control? My assumption is that it is the percentage of the Maximum Bulk/Absorb/Float Charge Current that I have set up elsewhere. So if I were to set the Maximum Charge Rate (%) to 10%, then it would only allow a 8.3A charge current? What situations would require this sort of adjustment versus just changing the absolute Maximums in the other three settings? And since the Charge Controller only has settings for the Maximum Charge Rate (%) and not the absolute Amperage maximums, I have to assume it uses whatever is plugged into the inverter?